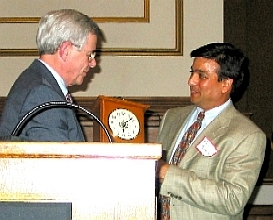 Silicon Valley entrepreneur Rajiv Parikh is the recipient of the 2006 University of New Hampshire College of Engineering and Physical Sciences Distinguished Alumni Award. Originally from Goffstown, Parikh now lives in Palo Alto, Calif., where he is currently founder and CEO of Position2 Inc., an online performance marketing company that combines search engine marketing with ad networks to generate sales leads for companies around the globe. After graduating from UNH, Parikh worked as a sales manager at AT&T Global Information Solutions, before earning an MBA from Harvard Business School in 1997. He then held senior positions at Sun Microsystems and AltaVista Company before co-founding Aperon Biosystems. He led the venture-backed medical device startup, which has so far raised more then $20 million in investor capital, for two years. He has also worked in the software, hardware and wireless industries.